The June issue of New Mexico Magazine is on newsstands now! I got my copy in the mail this week and found a few more copies at my local Borders. Here’s the cover, in case you’re looking for it. I’m on page 13! Whenever I get the weekly word, I always take a moment to sit back and think about it. What are the first impressions that come to mind? What hits first? So I did that this week. Cloud…cloud…what does that say to me….? 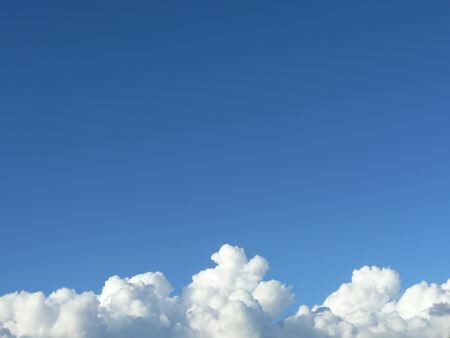 I haaaaaaate the ubiquitous use of the word “cloud” in today’s technical jargon. This concept isn’t new. It isn’t bold. It’s the same old bullsheet that’s been tried several times with mixed results. Once upon a time they called it hosted software. And then they called it application service provider or the more hip ASP. Back in the really golden old days they called it a Key Server. Even older than that was the not-very-PC term “dumb terminals”. It’s all essentially the same. I think “the cloud” is a dumb topic. Damnit, it’s not new and it’s not anywhere near as cool as the marketing would have you believe. Here’s what those cloud providers want you to do….they want you to save nothing on your own local machine. They want you to put every single dingle bit of your information on their servers. All of it. All your letters to gramma. All of your negative balance bank statements. Your high school diploma. That email to your doctor about the funny bump on your rump. ALL OF IT. And in return they promise, cross my heart and hope to die, that they’ll keep ALL of your data safe, tidy and secure. Here’s where my skepticism comes in. I’ve worked in data centers. I’ve been a part of some of the most sophisticated and well regarded data centers in the world. And you know what? Sh%t happens. Here’s a real world example: Very big data center in a very well regarded Fortune 50 company. My team had racked and stacked a large number of servers and storage devices. We were providing a for pay service to our customers with extraordinarily high expectations and high SLA’s. Some of the best and brightest database admins, network managers, technical support, and engineering minds maintained this environment to very tiny tolerances. One evening, the cleaning crew was doing their work in the data center and they plugged their vacuum into the power strip carrying the very, very delicate power balance for that entire row. And they blew the circuit. Now, we’d engineered the environment to fail over, and it did….but it was about a week to get all of those servers and storage devices brought back up, data restored and back to running in the production environment. I suggested we put baby proof socket covers on the power strips, and my suggestion was immediately adopted. Then there was the time the maintenance crew pushed a cart down the aisle and knocked the Ethernet cable out of every machine at about three feet high level. It took us a LONG time to sort out what happened there. And then one New Year’s Eve, a new security guard opened a wrong door and set off the alarm. In his haste to shut off the alarm, he hit a button by the door. The button was marked EPO. So he pushed it hard. EPO means “emergency power off” used in the case of something catastrophic. An alarmed door is not catastrophic. The entire data center went dark and knocked a several million dollar a day online store to go off the air. My point? If you entrust the cloud, back up your data locally. There are a million yabos in the world who can mess things up, even in the best of circumstances. Photo by username joegus74 and used royalty free from stock.xchng. This morning I came wheeling into work with a Very Dark cloud over my head. My boss, who I rather admire, did an unmitigated jerky thing* yesterday (as bosses are wont to do), and after a mostly sleepless night last night, I was still fuming as I drove into work. I wheeled my way into the parking garage and into my usual spot when I noticed what, on first glance, appeared to be a pile of trash. Upon climbing down out my decade old hoopty, I looked again at the pile of trash and tilted my head like a curious dog. There was something not so trashy about the trash. I was compelled to look again at the tableau, a still life in paper, cellophane and aluminum. The light was perfect, the scene so serene. So I had to take a photo. Several actually, as it was tough to capture just the right mood. 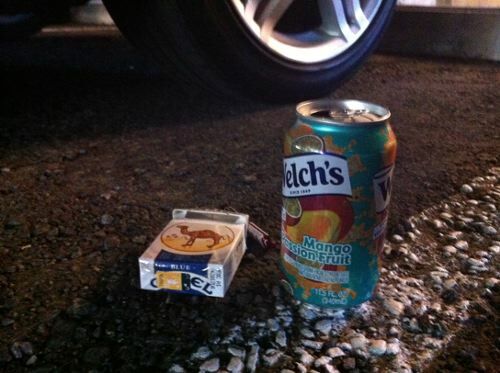 An empty pack of Camels, a Swisher Sweets wrapper and an empty can of Welch’s Mango Passion fruit juice. There was something of a discord between this scene and the shiny new Acura parked in the next spot. I suspect this art installation didn’t come from the Acura but arrived somewhere in the small hours of the night. In my ongoing self study of “where do ideas come from?” I found this particular bit of business to be a fine lesson. Ideas come from being awake to the world around. Ideas come from seeing things with a different eye. Ideas arrive when you look at a pile of discarded items and see something that you just *have* to look at a little harder. The artist in me had to stop to take a second look. The photographer in me had to take a photo. The writer in me is still working out my version of the back story that created this shrine in a parking garage. The ability to get fired up by the mundane…that’s where ideas come from. *The jerky thing was not directed at me personally, but it impacts my team in a negative way, and that make Hulk Maaaaaad. Today he and I talked it out and have arrived at a workable solution, so all is well again in Working Land. Photo taken by Karen Fayeth using the Camera+ app and subject to the Creative Commons License in the far right column of this page. As I was driving home, as low as I’ve been in a while (my favorite employee tendered her resignation) I knew I needed something comforting upon my arrival home. There are two ways this comfort could go, in my mind: sugar or alcohol. 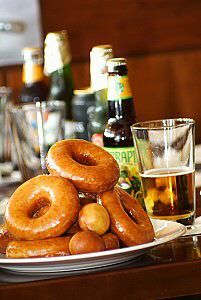 Two donuts or two beers? There is an AMAZING donut shop on my way home from work. It’s a local place where they make fresh donuts on site every day. It’s a heavenly experience just walking in the door. On the other hand…I had two pints of Murphy’s Stout cooling their heels to chilled perfection in my fridge. Oooh the creamy foam. Now…the answer couldn’t be “have both!” because while I’m certainly self destructive, I am lately trying to at least attempt to be a bit more health conscious. Two donuts and two beers seemed a bit over the top. Whatever I was going to have, it was going to be two. And don’t even bother suggesting “have neither and go take a walk.” I was way past that point. Two pints of Murphy’s stout come up to 400 calories, 0 grams fat, 46 carbs, and 4 grams protein. Hookay. Well, the beer is a few less calories, carbs and fat, so from a nutrition standpoint, beer seems to be the winner. How about the mental side? Well, alcohol is a bit of a depressant and it was likely that after two beers I’d be even more maudlin than I already was (a good Irish depression). The sugar and carbs in the donuts are a serotonin booster, so for mood enhancement, the donuts win. How about the after effects? Well, after the upside of the two beers wore off, I’d feel a bit headachy, dehydrated, bloaty, possible gastric distress and a bit mind muddled. After the good part of two donuts wore off I’d feel guilty, bloaty (owing to gluten sensitivity), possible gastric distress and a bit mind muddled. We’ll call this one a draw. So now I’m back to square one. Both have benefits. Both have drawbacks. It’s a delicious problem to have. In case the suspense is killing you…I chose two old fashioned donuts for drowning my sorrows and I don’t regret it. He was born in the Dominican Republic and plays for Detroit….but the young relief pitcher might just be one of our own. What do you say? 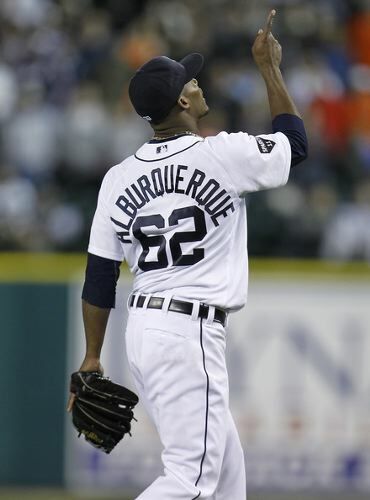 Should we adopt Al Alburquerque? He’s even got the extra r. I think we should.